Titus Walter Blessing was born on August 4, 1855 in Dubuque, Iowa to parents Franz Joseph and Magdalena Rausch Blessing. His father, who went by his middle name Joseph, was born in Germany in 1826 and immigrated to America in 1850. His mother was born in Bavaria in 1825 and her date of immigration is unknown. In 1860, Titus and his family were living in Porter, Freeborn, Minnesota, where his father was a farmer. In 1870, his family were still farmers and they had relocated to West Newton, Nicollet, Minnesota. Titus learned the mason trade and in 1876 he moved to Helena, Montana where he also mined and prospected across the state. During the Indian Wars of the 1870’s, Titus fought Sitting Bull’s band of Indians and served as a private scout for Buffalo Bill, himself a scout for General Miles. When war broke out with the Nez Perce tribe, Titus joined eighty other citizens of Helena to fight, but the government wouldn’t allow them to fight unless they joined the military. They declined and returned home to Helena. Therefore, they apparently missed the Battle of Big Hole. Titus met Anna Marguerite Hoffman, who had been born in Munster, Germany and immigrated to America in 1861, when she came from California to visit a cousin in Montana. 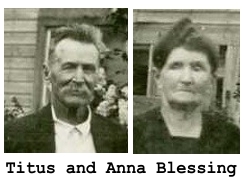 On May 31, 1879 Titus married Anna and in 1880 they were enumerated in Helena, with Titus employed as a stone mason. Their first child, Amelia, had been born two months earlier. In 1881, another daughter, Anna, was born. In 1883 the family migrated across the Big Bend country to Spokane. Titus left his family there and went to Coeur d’Alene, arriving before the gold rush. He assisted in drafting a resolution barring Chinamen from coming into Coeur d’Alene County. It’s quite possible that Titus might have met Wyatt Earp who came to Idaho with his brother and common law wife Josephine Marcus for the Coeur d’Alene and Pritchard gold rush. Mr. Blessing has held the office of justice of the peace and is an excellent officer, being faithful and impartial. He has been active in the advancement of educational facilities and is a progressive man in all lines. He has some fine placer ground in the Saint Joe region and is developing it well. Mr. Blessing and his wife are true frontier people and have done a good work in development and building up the country. Titus and Anna’s three youngest children were skating on Lake Coeur d’Alene Lake on November 29, 1906. Other skaters were rescued but their children drowned along with another local resident. They were buried in the Medimont Cemetery in Kootenai County, Idaho. Tragedy, unfortunately, struck again just three years later when their second daughter Anna died of an infection induced by surgical thread and scissors left in her body during surgery for cancer, according to family history. Anna was twenty-eight years old at the time of her death and was married to Eugene Leslie Lamb. Their son, Harvey Allen Lamb, had been born in 1906 and in 1910 Harvey (4 years old) was living with Titus and Anna in Medimont. His father remarried but it appears Harvey remained with his grandparents – he is again enumerated as their grandson in 1920. Their daughter Rose, who had married John Ahlstrom, passed away in 1924 – like her sister Anna she died from complications following cancer surgery. She and her sister both were buried in the Medimont Cemetery with their younger siblings. Titus continued to farm. At the age of seventy-four, he and Anna were enumerated in 1930 and living in Medimont. Their son Walter lived nearby and was employed as a farmer as well. 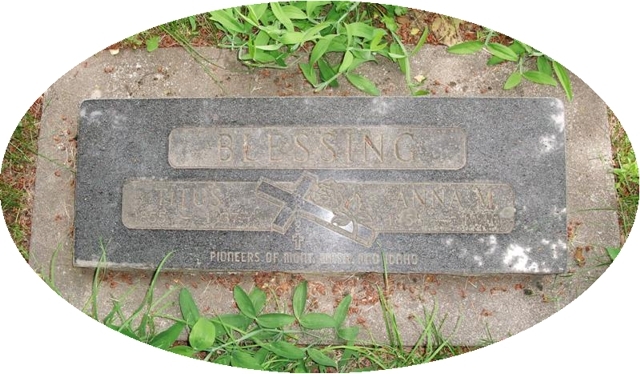 On July 16, 1937, Titus Walter Blessing passed away at the age of eighty-one and was buried in the same cemetery as his children who had preceded him in death. His widow Anna and their son Walter would be buried in the same cemetery, Anna in 1940 and Walter in 1967. 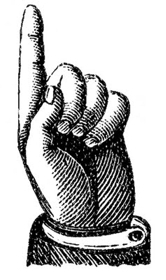 A pioneer of the true grit and spirit, a man of sound principles and uprightness, a public minded citizen of worth and integrity, and always dominated with sagacity, keen foresight and manifesting energy and enterprise, the subject of this article is deserving of consideration in the history of this county. A note of interest — the reader might notice links to previous articles I’ve written and published. I didn’t intend that there would so many links (Wyatt Earp, Josephine Marcus, The Battle of Big Hole) as Titus Blessing was, as is customary for the Tombstone Tuesday articles, picked randomly. I just love it when stuff like this happens though — and just another reason why I LOVE history and writing this blog! I came across this article on the Blessing family researching Wyatt Earp. Fantastic article – I found it very interesting – a little sad, but I am extremely glad I came across it. It is amazing how one story leads you to two or three others. It truly is a small world. Wyatt Earp research? That’s interesting. Wyatt is my third cousin, three times removed. I’m glad you enjoyed the article — it was a gem to discover and write about! Thanks for stopping by!